Vile Vapor is an exclusive shout used in combat by the Afflicted during The Only Cure. 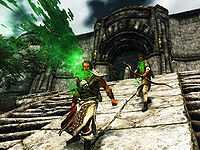 Dawnguard adds the ReaperDG, who also has this ability. When provoked, both the Afflicted and the Reaper will vomit poisonous fog at you, which does lingering health damage. This page was last modified on 15 November 2016, at 06:22.